This is a story about discovering some truly lost, unknown and forgotten theatrical quality cartoons directed by Carl Urbano, and a description of those cartoons. I am certain more of these cartoons are out there, so please comment about ones you know and we will update the Urbano filmography in a future “Part 2” of this article in 2016. Animation director Carl Urbano is widely known and well respected for his Hanna-Barbera television cartoon series and features from 1977 to 1992: The Godzilla Power Hour, Super Friends, The New Fred and Barney Show, Scooby-Doo and Scrappy-Doo, The Smurfs and many more (check the Honda commercial from 1987 at right). In this case, “many more” is an understatement. Just look Carl Urbano up on the IMDB. His early history mentions that he directed “industrial cartoons” for John Sutherland Productions in the 1950s. However, a complete list of the Urbano/Sutherland cartoons from this period does not exist. The 35mm print was booked into theaters — that was at a time when cinemas actually SHOWED short-subjects before the feature instead of TV commercials. The 16mm prints (also dye-transfer IB Technicolor) were given to 16mm non-theatrical distributors which specialized in loaning industrial type films like this free of charge to schools and institutions and other non-profit entities. The arrangement benefited the companies that produced them (getting name recognition and sometimes including not-so-subtle advertising content) and it benefited the end-user as it gave schools and the like an inexpensive and welcome means to put together screen entertainment. 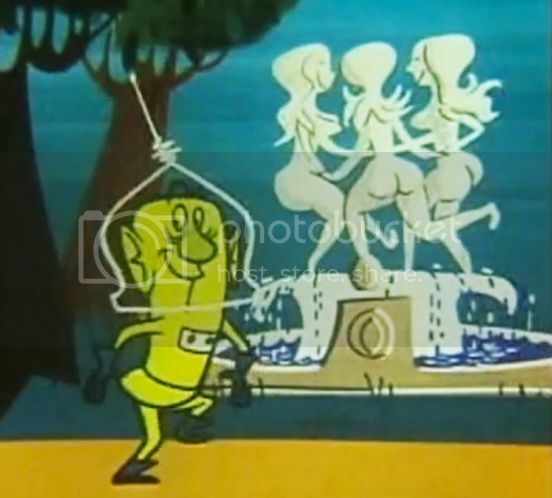 Here is how we found 3 lost Urbano cartoons. “We” is me and two partners I work with in a project called “Lost and Rare Film and TV Treasures.” Under this banner we have issued DVDs of extremely rare films that are not available anywhere. Our first thematic DVD collections were Sports Immortals, Lost TV Pilots and Golf Mania. The first partner is Bob Campbell, who produced Matinee at the Bijou for PBS in the 1980s. Second is Derek Myers, a film collector and Producer-Director and Senior Video Editor at WGGS TV-16 in Taylors, South Carolina. Derek has a particular knack for finding obscure 16mm films on ebay or private collections that become otherwise available. All three of us specialize in public domain films. Early this year Derek acquired a small group of industrial films, which led to us putting six films into a Lost and Rare collection called Industrial Strength America. This includes The Columbia (1942) about the building of the Grand Coulee Dam in the state of Washington, featuring three original songs by Woody Guthrie; Unfinished Rainbows (1940, color) tells the story of aluminum and features actor Alan Ladd in his first credited role. Both of these are from the Bijou collection, while Derek supplied the other four films. Born in Freedom: the Story of Colonel Drake (1954, color) is a half-hour story about the drilling of the first oil well and stars Vincent Price. Asphalt Through the Ages (1957, color) tells the story of … you guessed it … Asphalt, and is the only routine industrial on the DVD, where in a mere 13 minutes one can learn the fascinating uses of asphalt in building the Tower of Babel and Noah’s Ark, not to mention roads, roofing, etc. Why Play Leap Frog? (1950, color, 10m.) Harding College. No copyright notice or date. Released theatrically by MGM. Not rare, can be viewed on youtube. The Devil and John Q (1951, color, 10m.) 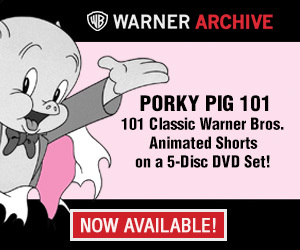 1951 copyright on the film, but never registered. RARE. It’s Everybody’s Business (1954, color, 20m.) Copyrighted by Chamber of Commerce of the United States in cooperation with E.I. du Pont de Nemours. Not rare; on youtube. Destination Earth (1956, color, 14m.) Produced for American Petroleum Industry. 1956 © notice on the film but not registered. Not rare; on youtube. Dear Uncle (Color, 9m.) Harding College. No copyright notice or date. No info on Internet. Not on youtube. RARE! The films fall into two categories. Two are obvious propaganda for the petroleum industry, while the others are public service films sponsored by Harding College. A foreword to Why Play Leap Frog? explains: “This is one of a series of films produced by the Extension Department of Harding College to create a deeper understanding of what has made America the finest place in the world to live.” Another title card says “Fun and Facts About America.” These films were likely aimed at schools since they truly have educational value about american business and economics. Here is an excerpt from Dear Uncle, which we only recently discovered that we had. Can anyone suggest the year it was made? I would guess early 50s since it has more of a 1940s animation style than the sleeker look of Fill ‘Er Up. The subject is as timely as today’s headlines — the need to pay taxes. The third unknown Urbano/Sutherland cartoon that we have is the most interesting one of all. The Devil and John Q (1951) opens with a vivid cartoon depiction of Hell. The Devil himself wants to vex America by spurring inflation and he takes several guises in our world to work his devilish ways. His final disguise is as a southern Senator (a Republican?) who blows his stack. The hero is a meek economist who preaches the need to control inflation. Derek had two prints of John Q, but only recently did we notice that they were different versions. Producer Jerry Fairbanks acquired the film in the 1970s for the National Education Program (whoever they were) and planned to update and reissue it with different dialog. The revision does not have a date and we don’t know if it was ever released. Fairbanks’ last production was in 1972 and he died in 1995 at the age of 90. The story goes that just a few years ago one of Fairbanks’ storage facilities was being emptied; some friends found out and rescued this film and many priceless early TV shows from a dumpster, then put them on ebay where Derek found them. Yes, that dumpster thing still happens. Here are the openings to both versions. The 1951 version references Communism, the atom bomb and the Cold War, which have all been removed for 1970 audiences. Make Mine Freedom (1948) Harding College. The dangers of Communism. On youtube. Why Play Leap Frog? (1949, color, 10m.) Harding College. About economics. on youtube. Meet King Joe (1949) Harding College. Economic propaganda. On youtube. A Is For Atom (1952, 15m.) by General Electric Co. on youtube. It’s Everybody’s Business (1954, 20m.) © by Chamber of Commerce of the United States in cooperation with E.I. du Pont de Nemours. Business economics. On youtube. Working Dollars (1956) New York Stock Exchange. On youtube. Dear Uncle (1953, color, 9m.) Harding College. Frank Nelson and Herb Vigran are two of the voices.﻿ No copyright notice or date. No info on Internet. Not on youtube. RARE! And what did Carl Urbano do between Rhapsody in Steel in 1959 and the Scooby’s Laff-A Lympics TV show in 1977? From my experience, the Harding College films seem to be the better known ones from Carl Urbano, if mostly due to the heavy-handed anti-communist propaganda that spearheaded most of them. Of these, “The Devil and John Q” certainly seems the most interesting and potentially entertaining. Though it’s a pity it’s just a cliff. Great article by the way. I’m really digging these articles on these well-done industrial films and Carl Urbano’s certainly deserve a closer look. Yes, in the Deep South, the Jim Crowe states were essentially the seemingly eternal domain of what were known as the “Liberal Democrats” or “Southern Democrats” which were the primary enablers of the “status quo” in those regions. Obviously much of that changed in the 60s onward as the Southern Democrats were forced to give themselves a facelift to keep up with the times (some sooner than others). Many of the old segregationist Democrats didn’t get a facelift but a new party. When the DNC embraced civil rights, a bunch of Southerners broke off and became the “Dixiecrats”, staying in power with the old anti-civil rights line. Then they were courted by the Republican party (Nixon’s “Southern Strategy”). In time former Democrats/Dixiecrats like Strom Thurmond became major powers in the GOP, and effectively converted the GOP to the anti-civil rights line now rejected by the DNC. Some GOP pundits still cite Democratic racism in the old South, not mentioning its specific champions had long since brought their act to the GOP and prospered. “Dear Uncle” can be no later than 1954, since you’ll notice the tax day on the newspaper is March 15. It was moved to April 15 for 1955. Judging from some historical tax charts, it does appear that there were tax increases related to the Revenue Act of 1951 and the Revenue Act of 1950, likely tied to the Korean War. Before that, there were changes in the tax rates owing to the Revenue Acts of 1945 and 1948, which *reduced* tax rates. The Revenue Acts of 1950 and 1951 increased both corporate and personal income taxes. You’ll note the excerpt posted takes care to refer to both. My guess, based on these historical facts, is that the cartoon was likely produced some time in 1950 or 1951, at the time taxes were increased, to make the bitter pill go down. I would suggest cross-referencing the listed animators (Gillespie, Hawkins, Monroe) to see if they were working for major studios during this time. Who did the voices in “Fill’er Up”? Herb Vigran is yelling “Fill er up!” at the start. The narrator is Bud Hiestand who was, among other things, the announcer on Mel Blanc’s radio show. Marvin Miller is the genie. In an expansion of industrial film activities, John Sutherland Productions is propping a 45-minute feature for National Carbon Co., and a 30-minute feature for Kaiser Aluminum & Chemical Co. Carbon Co. picture will be filmed in color, on subject of industrial public relations, and is for use by its sponsor both on TV and before groups. Kaiser film will be in 16m Kodachrome, and combo live-action and animation. Two additional Technicolor animation shorts also are being started for program which Metro in the past has released. First is “Dear Uncle,” dealing with taxes, and second, “The Devil and John Q,” on inflation. Three previous shorts in this series received awards from Freedom’s Foundation in Valley Forge, for achievements showing the American way of life. Trio included “Make Mine Freedom,” which won the award in 1949; “Albert in Blunderland,” 1950 winner; and “Why Play Leapfrog,” 1951 winner. Urbano was doing some work in Hanna-Barbera’s industrial division in the ’60s. Trivia note: Bill Hanna, Mike Lah and Urbano were sharing an address in 1940. Hanna and Lah were brothers-in-law. John Sutherland was of course able to produce cartoons on a Disney level because he was spending his clients’ money to make them, not his own. A bank president’s son and an old-school Republican, I understand his main selling ploy was to go out golfing with, say, the head of Du Pont or the chairman of the New York Stock Exchange, and convince them that animated cartoons were just what they wanted to put their message across to the public. Whatever you think of his aims, Sutherland cartoons showed off the work of an all-star crew of talented animators at their best. Any idea who directed “Horizons of Hope” (1954)? It was a 20-minute animated/live-action picture Sutherland made for the Sloan Foundation. I can’t find credits in the Copyright Catalogue. Why Play Leap Frog? (1950, color, 10m.) Harding College. No copyright notice or date. Released theatrically by MGM. 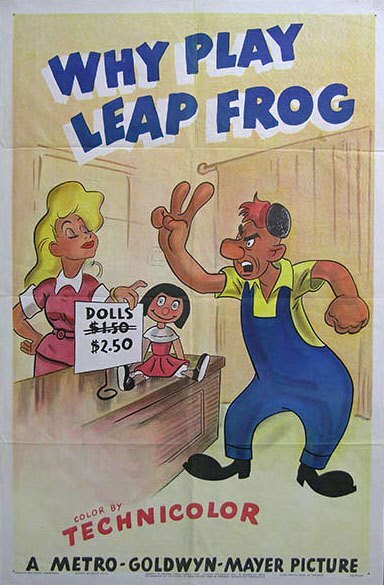 Given the theatrical poster included, I’m amused the artist hiked up the price of the doll by fifty cents more than what is given in the film! I’m sure that’s in all our minds while watching these. It’s like, were they even approached for such a deal? These things just sorta happen or they don’t, and I guess for Sutherland, such a lucrative deal with a major studio to provide entertaining shorts just never happened. Actually, John Sutherland DID at one time have an entertainment cartoon contract, and with United Artists at that. He and ex-Disneyite Larry Morey were partners in a company producing animated puppet shorts (a la George Pal) for UA in the mid-late 1940’s; just before Walter Lantz’s brief alliance with the distributor. 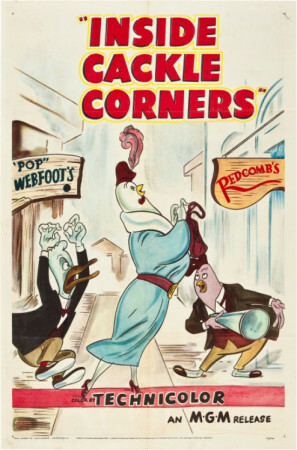 The series was called “Daffy Ditties” (another echo of the Silly Symphonies, Merrie Melodies, etc. ); only six were made, they were not successful, and all the negatives were destroyed in a vault fire not long after they were released. His experience with the “Daffy Ditties” actually made up Sutherland’s mind to make nothing but sponsored industrial films from then on. I’ve seen one of them, a poorly-preserved print of (I might have the title messed up) “The Lady Didn’t Say No,” which has Frank Tashlin’s fingerprints all over it, to great effect. That was “The Lady Said No”. And to clarify: that “poorly-preserved print” you saw of The Lady Says No was actually not “preserved” at all, but SAVED by Mark Kausler, who, in his over 50 years of film collecting, was able to find a one minute color fragment and a black and white 16mm print and cobbled them together to allow us to see this lost film. As the negatives for The Lady Says No – as well as all the other United Artists Daffy Ditty cartoons – are nonexistent, I’m grateful this “poorly-preserved print” is around to view. I’m happy to rephrase re “The Lady Says No”: no aspersions were meant re Mark’s preservation efforts. I see nobody has mentioned the movie “Dear Mr. President” which was a mix of live action and animation. It was ready to be shown when the whole Nixon fiasco happened, so it was never shown that I know of. The movie was made from a book (with same name I think) written by Art Linkletter. This article got me looking again. YouTube also has an Urbano film titled FRESH LAID PLANS from 1951. If you guys are interested I have some old 16mm B&W films, all silent: Disney, Kiko Kangaroo, Frank Buck. I’d like to see them go to someone who appreciates them, so I’d donate them to your cause. Also have a 16mm ASTRO BOY episode. I want point out that the video has been deleted. I have a reel of It’s Everybody’s Business 16 MM . Does it have any value? RON HALL started by collecting 16mm films decades ago and still has a fondness for sprocket holes and film cement. He has been in business as Festival Films for over 30 years – and knows public domain films inside and out. He also helped publish the seminal cartoon fanzine Mindrot (later Animania) back in the 1970s and 80s. In other words – he knows his stuff!